preparation This theme is discussed in detail at phasmatodea.com. 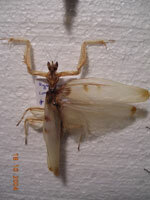 The methods apply to mantids, at the bottom there is a link to it. (Thanks to Oskar Conle and Frank Hennemann - Phasmatodea.com). 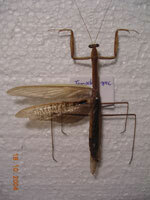 Big mantids should be excluded, because they can digest. For this, you make a cut at the underside between two segments. After disembowel the offal, the abdome is filled with cotton and can be formed. You have to be very carefull, because the pigmentlayer (inside of the chitin-carapace) can remove and this area can get transparent. The following pictures show preparated mantids, with an often used positioning.